Download "PATIENT INFORMATION LEAFLET. 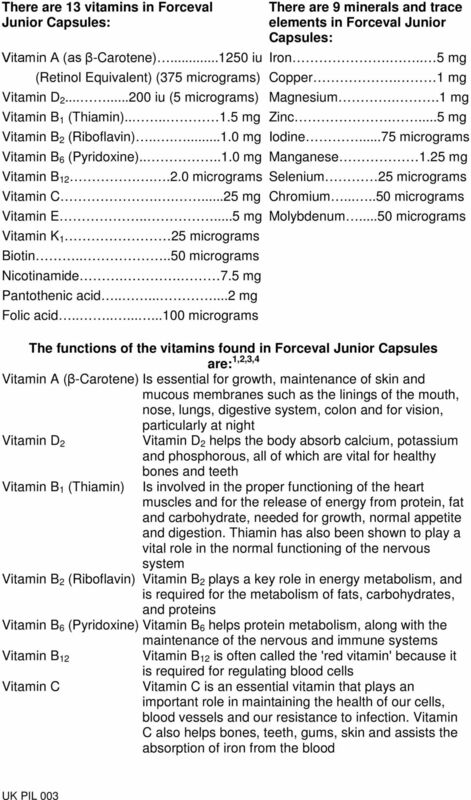 Forceval Junior Capsules"
3 Vitamin E Vitamin K 1 Biotin Nicotinamide Pantothenic acid Folic acid Vitamin E is a highly effective antioxidant, helping to protect the body from the effects of free radicals. It also helps to maintain healthy skin and blood cells Vitamin K is essential for blood clotting Biotin is needed for normal growth and development of the skin and hair, the maintenance of a healthy nervous system and the healthy functioning of bone marrow Nicotinamide (also known as Vitamin B 3 ) is essential for a healthy nervous system Pantothenic acid plays a vital role in the process of releasing energy from foods, the role of fat metabolism and the provision of the immune system with antibodies Folic acid is required to regulate the growth of cells including red blood cells and protein synthesis. The main functions of the minerals and trace elements are: 1,2,3,4 Iron Iron forms part of red blood cells which carry oxygen round the body Copper Is required for growth and forms part of enzymes involved in blood and bone formation Magnesium Magnesium is essential for the formation of bones and teeth, and for the release of energy from food Zinc Zinc is required for growth and cell function, bone metabolism, taste, insulin production and the body s immune system which fights infection Iodine Involved in the functioning of the thyroid gland which regulates many of the metabolic processes of the body Manganese Manganese helps the body to utilise calcium and potassium and maintain the structure of cells Selenium Selenium helps to protect the cells and lipids from free radical damage Chromium Helps the body to use glucose by its action on insulin Molybdenum Is involved in the enzyme processes for protein metabolism. 2. 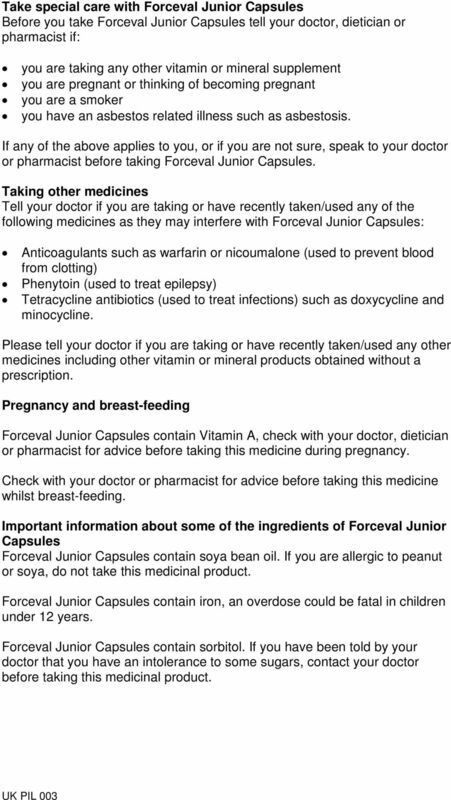 Check before you take Forceval Junior Capsules Do not take Forceval Junior Capsules : if you are allergic (hypersensitive) to any of the ingredients of Forceval Junior Capsules (see Section 6 Further information) if you suffer from iron storage disorders such as bronzed diabetes (haemochromatosis). Do not give Forceval Junior Capsules to children aged under 5. 4 Take special care with Forceval Junior Capsules Before you take Forceval Junior Capsules tell your doctor, dietician or pharmacist if: you are taking any other vitamin or mineral supplement you are pregnant or thinking of becoming pregnant you are a smoker you have an asbestos related illness such as asbestosis. If any of the above applies to you, or if you are not sure, speak to your doctor or pharmacist before taking Forceval Junior Capsules. Taking other medicines Tell your doctor if you are taking or have recently taken/used any of the following medicines as they may interfere with Forceval Junior Capsules: Anticoagulants such as warfarin or nicoumalone (used to prevent blood from clotting) Phenytoin (used to treat epilepsy) Tetracycline antibiotics (used to treat infections) such as doxycycline and minocycline. Please tell your doctor if you are taking or have recently taken/used any other medicines including other vitamin or mineral products obtained without a prescription. Pregnancy and breast-feeding Forceval Junior Capsules contain Vitamin A, check with your doctor, dietician or pharmacist for advice before taking this medicine during pregnancy. Check with your doctor or pharmacist for advice before taking this medicine whilst breast-feeding. Important information about some of the ingredients of Forceval Junior Capsules Forceval Junior Capsules contain soya bean oil. If you are allergic to peanut or soya, do not take this medicinal product. Forceval Junior Capsules contain iron, an overdose could be fatal in children under 12 years. Forceval Junior Capsules contain sorbitol. If you have been told by your doctor that you have an intolerance to some sugars, contact your doctor before taking this medicinal product. 5 3. How to take Forceval Junior Capsules Children 5 years and over: Two capsules per day or as prescribed by the doctor. The capsules should be swallowed whole with a glass of water. Adults and elderly: Not recommended. Do not take Forceval Junior Capsules on an empty stomach. 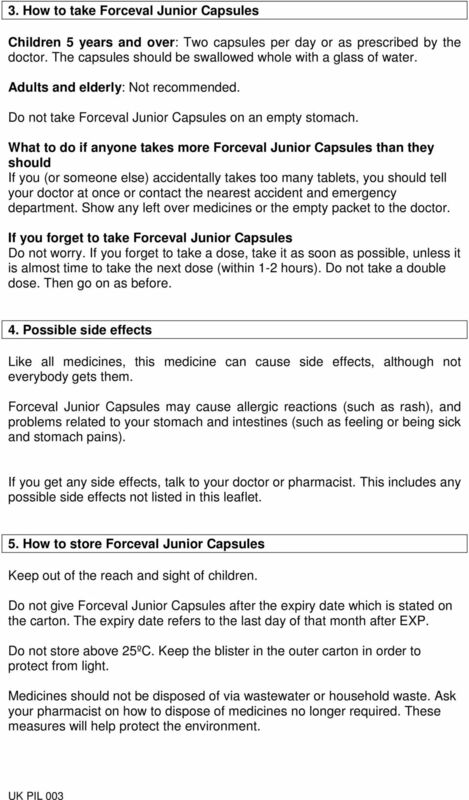 What to do if anyone takes more Forceval Junior Capsules than they should If you (or someone else) accidentally takes too many tablets, you should tell your doctor at once or contact the nearest accident and emergency department. Show any left over medicines or the empty packet to the doctor. If you forget to take Forceval Junior Capsules Do not worry. If you forget to take a dose, take it as soon as possible, unless it is almost time to take the next dose (within 1-2 hours). Do not take a double dose. Then go on as before. 4. Possible side effects Like all medicines, this medicine can cause side effects, although not everybody gets them. Forceval Junior Capsules may cause allergic reactions (such as rash), and problems related to your stomach and intestines (such as feeling or being sick and stomach pains). If you get any side effects, talk to your doctor or pharmacist. This includes any possible side effects not listed in this leaflet. 5. How to store Forceval Junior Capsules Keep out of the reach and sight of children. 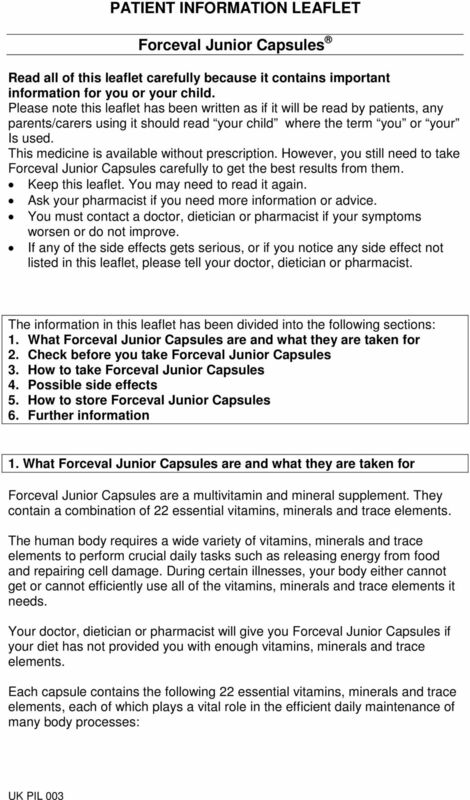 Do not give Forceval Junior Capsules after the expiry date which is stated on the carton. The expiry date refers to the last day of that month after EXP. Do not store above 25ºC. Keep the blister in the outer carton in order to protect from light. Medicines should not be disposed of via wastewater or household waste. Ask your pharmacist on how to dispose of medicines no longer required. These measures will help protect the environment. 6 6. 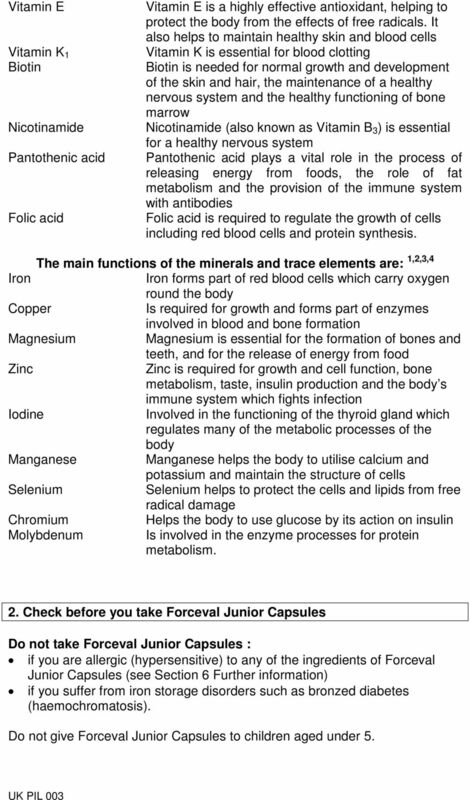 Further information What is in Forceval Junior Capsules? The active ingredients in this medicine are: Vitamin A (as β-carotene), Vitamin D 2, Vitamin B 1, Vitamin B 2, Vitamin B 6, Vitamin B 12, Vitamin C, Vitamin E, Vitamin K 1, Biotin, Nicotinamide, Pantothenic acid, Folic acid, Iron, Copper, Magnesium, Zinc, Iodine, Manganese, Selenium, Chromium, Molybdenum. The other ingredients are Soya Bean Oil, Soya Lecithin, Hard Vegetable Fat (Biscuitine 621), Purified Water, Gelatin, Glycerine, Black Iron Oxide Pigment (E172), Red Iron Oxide Pigment (E172) and Sorbitol Solution 70% (E420). What Forceval Junior Capsules look like and contents of the pack Forceval Junior Capsules are small, brown, oval-shaped soft gelatin capsules numbered 571 in white on one side. They come in cartons containing 30 or 60 capsules. Marketing Authorisation Holder and Manufacturer The product licence holder is: Alliance Pharmaceuticals Limited, Avonbridge House, Chippenham, Wiltshire, SN15 2BB, UK. Forceval Junior Capsules are manufactured by: TD Packaging Ltd, Stephenson Road, Groundwell Industrial Estate, Swindon, Wiltshire SN25 5AX, UK. 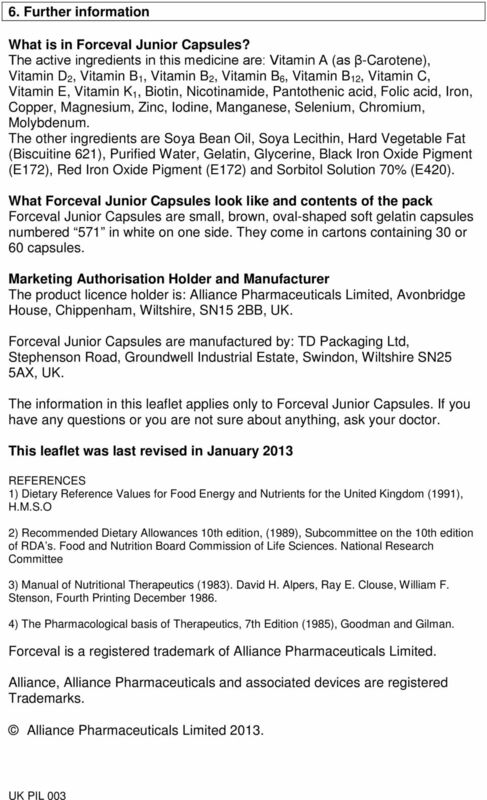 The information in this leaflet applies only to Forceval Junior Capsules. If you have any questions or you are not sure about anything, ask your doctor. This leaflet was last revised in January 2013 REFERENCES 1) Dietary Reference Values for Food Energy and Nutrients for the United Kingdom (1991), H.M.S.O 2) Recommended Dietary Allowances 10th edition, (1989), Subcommittee on the 10th edition of RDA s. Food and Nutrition Board Commission of Life Sciences. National Research Committee 3) Manual of Nutritional Therapeutics (1983). David H. Alpers, Ray E. Clouse, William F. Stenson, Fourth Printing December ) The Pharmacological basis of Therapeutics, 7th Edition (1985), Goodman and Gilman. Forceval is a registered trademark of Alliance Pharmaceuticals Limited. Alliance, Alliance Pharmaceuticals and associated devices are registered Trademarks. Alliance Pharmaceuticals Limited 2013. PATIENT INFORMATION LEAFLET CEFALEXIN 250 mg AND 500 mg CAPSULES CEFALEXIN Read all of this leaflet carefully before you start taking this medicine. - Keep this leaflet. You may need to read it again. PATIENT INFORMATION LEAFLET Cafergot tablets 1 mg ergotamine tartrate and caffeine Read all of this leaflet carefully before you start taking this medicine Keep this leaflet. You may need to read it again. There is a risk of renal impairment in dehydrated children and adolescents. VITAMIN. guide. It s time to simplify vitamins. Tips and advice from your pharmacist. Look inside for your free money-saving Vitamin Club Card. Always take this medicine exactly as described in this leaflet or as your doctor, pharmacist or nurse have told you. CHLORPHENAMINE. The medicine you have purchased contains chlorphenamine. After all, our children deserve the very best! PACKAGE LEAFLET: INFORMATION FOR THE USER PROPECIA 1 mg film-coated Tablets (finasteride) This medicine is for use in men only Read all of this leaflet carefully before you start to take this medicine. PACKAGE LEAFLET: INFORMATION FOR THE USER PARACETAMOL MACOPHARMA 10 mg/ml, solution for infusion Paracetamol Read all of this leaflet carefully before you start using this medicine. Keep this leaflet. What is the most important information I should know about TEMODAR? 3 Daily Plus. Another in Dr. Smith s Client Education Series Presented by Sera Vita LLC. What makes a good multi vitamin and do you really need one? [For POM]: Read all of this leaflet carefully before you start using this medicine. PACKAGE LEAFLET PACKAGE LEAFLET: INFORMATION FOR THE USER /.../ 2.5 mg orodispersible tablets Desloratadine Read all of this leaflet carefully before you start taking this medicine. - Keep this leaflet. FLUCLOXACILLIN Flucloxacillin, as the sodium salt What is in this leaflet This leaflet answers some common questions about FLUCLOXACILLIN. It does not contain all the information available on this medicine. If you forget to use Catacrom Eye Drops If you forget to use this medicine, use it as soon as you remember. 1 What Anapen is and what it is used for? DOXYLAMINE. Please read this leaflet and the packaging of the medicine you have purchased carefully before you start using doxylamine.